Just wanted to pop in and give you a pattern update: the alpha version is done. This means the pattern is finished (written, photos all annotated, templates all scanned, sketches all made and imported, proofread etc) but untested. Last night it went off to the testing lab and this week it will be put through its paces. In case you were wondering, I only have one pattern tester, but she is the best. I've tried having 10 pattern testers but you know what? You don't need multiple pattern testers with multiple levels of sewing experience to test a pattern meant for one particular skill level. You just need one - but she needs to be a person with considerable experience in sewing many, many bags from many, many other patterns; also a perfectionist, an extremely skilled seamstress, and a good enough friend so that she can properly critique the instructions without holding back or worrying about hurting my feelings or discouraging me or anything ridiculous like that. If you've never written a pattern, I thought you might find my self-imposed timeline interesting -or (if it's not your thing) coma-inducing. 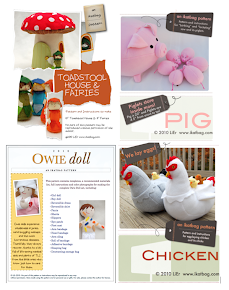 Decide to do instructions for a project I'm making (rather than just make-and-brag on the blog). 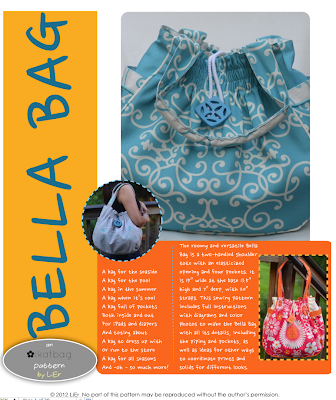 Decide if the instructions are short enough to be a free tutorial or require so much detail that they would be better as a multi-page pattern. Decide to make it a pattern and begin visualizing the stages of construction. Shop for fabrics with high contrast for good visibility in photos. Also shop for enough different fabrics to make multiple versions of the project for beauty shots. Stage 1 testing: cut out several versions of the project, in multiple fabrics, putting aside one version for instructional photos. Sew up the other versions of the project, making copious notes at each stage about which parts might be difficult to understand and which will require special photos/sketches and/or instructions. Sew up the Instructional Version, taking photos of each step. Re-size, edit and annotate the photos. Write the instructions, including dimensions and importing photos into their relevant positions on the pages. Write the introduction sections: overview, tips, materials list, glossary etc. Print out, manually proofread (this was when I was lying in a hammock at the lake on the 4th of July) and check for comprehensiveness. Take additional photos and draw additional sketches. Scan and import all hand-drawn sheets. Edit, crop, resize and annotate all new photos and sketches, and incorporate them into existing instructions. Re-paginate entire document, correcting all references to old page numbers. Check for size of document file - resize photos if necessary to reduce size to something most people's bandwidth can handle. Print out for final proofread. Check templates print out to correct size. Alpha version completed. Send Alpha version to testing lab. Wait for testing lab to return feedback and photos. Meanwhile correspond with tester for real-time comments and feedback. Make edits to alpha version immediately (so won't forget). Stage 2 testing: using actual instructions and templates of printed alpha version, cut out and sew at least two more versions of the project. Take notes on which parts do not flow with existing instructions or of additional instructions that must be added. Combine own feedback with feedback from tester into Beta version of pattern, rescanning templates and editing photos and instructions in process. Proofread Beta version. Print out Beta version to ensure all things print within margins etc. Decide on price of pattern. Upload pattern to hosting site. Take photos of projects for etsy store. Decide on price of items, weigh them for shipping costs, list items. 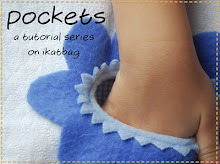 Write blog post about new pattern, instructions for use and link to etsy shop for non-sewing readers to have option to buy items instead of making them. Make pattern available for sale. Get set for the next stage - obtaining mailing supplies for potential sales, checking email for download problems or questions regarding pattern etc. We're at Step #19 of this process for the Bella Bag pattern, incidentally. Another 11 steps to go! Notice that none of those steps even involve nutella? That's how serious pattern-writing is. I'm always exhausted after. It's never as simple as just writing a tutorial because everything has to be explained, down to the parts of a zipper and layout and grain, so readers know exactly what I'm talking about without me actually being there in person to demonstrate. And it needs so much concentration that I can only do it when the children are out cold which, in these hectic summer months, is later in the night than I'd like. And usually, after working on pattern-writing all evening, I need to end the day with something that's completely unrelated, like reading or painting. All this makes for long working days and it is also why I've thrown out numerous patterns in various stages of completion - some never made it past Step 3 (Decide that it should be a pattern) and some are aborted after all the photos were taken (Step 7) because I couldn't bear to invest any more time in it. The only thing more difficult to finish than a pattern is drafting and sewing clothes on a deadline. I've gotten really good at procrastinating on both! So today, in the name of exhaustion, I'm going to a park with the kids. Tomorrow I'll begin work on Stage 2 testing - and hopefully, that gorgeous Orla Kiely bag will be born as a result of that happy process. Thanks for all your patience, guys and for your interest in this pattern! It will be ready very soon! "It will be ready very soon." ... 'Soon' is a relative term, right? Like, it might be slightly (of course) different for your future customers than for your pattern tester? Methinks your pattern tester had better engrave a flashing neon "SOON" in her brain for visibility at all times! And this is why I LOVE your patterns! They are much more dependable than any commercial patterns I have purchased, which most definitely do NOT follow your steps! Good for you! You have oodles of patience. I've gotten as far as Step 7 before decided I preferred sanity to professional patterns. I think I am glad it is you not me! You are so creative though, gorgeous patterns! I read every single word of this post. So while I was entertaining the thought of turning some of my recent quilt designs into patterns I have recently (like in the last five minutes) decided not to. I know your pattern tester--you have the absolute tops in the industry!! But of course you already know that! P.S. Where did you get the Orla fabric?